The Sheren&dolphen project strictly consists of 292 pictures that were taken in/around art actions, all over the world, from July 2003 to September 2006. These were catalogued and self published on CDs and in my former web site. The project arose from the necessity of involving persons and places in the poetic of Sheren and to document the participation. 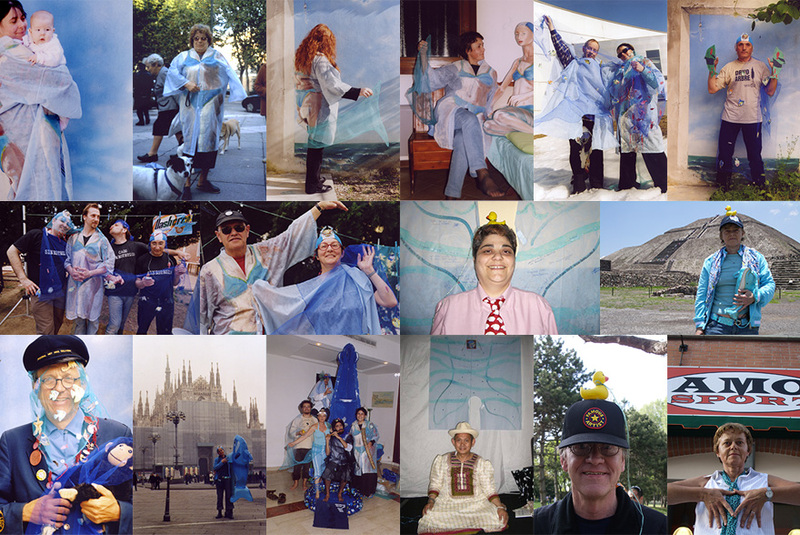 First picts show persons wearing Sheren/dolphen costume at art gatherings or in my studio-home-gARTen. It was part of the performance and each one had to write the address in my note book, to have the photo mailed later. As things went on, the temporary exchange/sharing included S&D’s accessories or the entire setting of the installation where the performance had taken place. 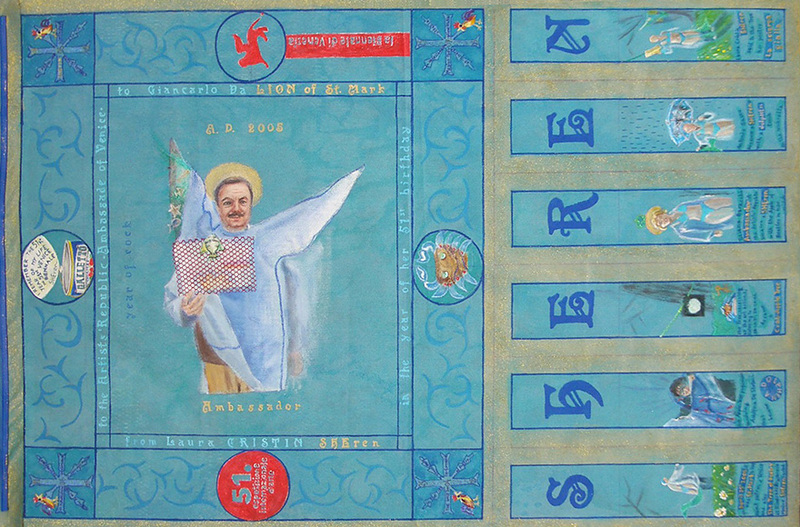 In 2005 some snaps of a collateral event in 51st Biennale di Venezia, were reproduced/depicted on an azure nonwoven textile: the first “Sherensign”! Some items are a sort of personal documentation of the “etceteras” or deal with the “imprinting” of the places. See the ones taken at an archeological site in Mexico, with the Sun and the Moon pyramids in the background, the picts about the founding/travels of the “beached” dolphin, or many landscapes seen from a Sheren’s veil or with a stick-of-rain at the side. After some years I realized that perhaps the inner core of this project was/is a sort of giving/receiving from places/persons met along the way. Consider for instance the emotion of people shaking little bags of sugar in a performance so to interact with not-only-my-music. This happened in Madrid and several other times. Or a butterfly passing nearby. It’s impossible and no worth in the end, to record this otherwise than by heART!